"North Atlantic Drift" redirects here. For the 2003 rock album by Ocean Color Scene, see North Atlantic Drift (album). The North Atlantic Current is the first leg in the North Atlantic Subpolar Gyre. The North Atlantic Current (NAC), also known as North Atlantic Drift and North Atlantic Sea Movement, is a powerful warm western boundary current within the Atlantic Ocean that extends the Gulf Stream northeastward. The NAC originates from where the Gulf Stream turns north at the Southeast Newfoundland Rise, a submarine ridge that stretches southeast from the Grand Banks. The NAC flows northward east of the Grand Banks, from 40°N to 51°N, before turning sharply east to cross the Atlantic. It transports more warm tropical water to northern latitudes than any other boundary current; more than 40 Sv in the south and 20 Sv as it crosses the Mid-Atlantic Ridge. It reaches speeds of 2 knots near the North American coast. Directed by topography, the NAC meanders heavily, but in contrast to the meanders of the Gulf Stream, the NAC meanders remain stable without breaking off into eddies. The colder parts of the Gulf Stream turn northward near the "tail" of the Grand Banks at 50°W where the Azores Current branches off to flow south of the Azores. From there the NAC flows northeastward, east of the Flemish Cap (47°N, 45°W). Approaching the Mid-Atlantic Ridge, it then turns eastward and becomes much broader and more diffuse. It then splits into a colder northeastern branch and a warmer eastern branch. As the warmer branch turns southward, most of the subtropical component of the Gulf Stream is diverted southward, and as a consequence, the North Atlantic is mostly supplied by subpolar waters, including a contribution from the Labrador Current recirculated into the NAC at 45°N. West of Continental Europe, it splits into two major branches. One branch goes southeast, becoming the Canary Current as it passes northwest Africa and turns southwest. The other major branch continues north along the coast of Northwestern Europe. Other branches include the Irminger Current and the Norwegian Current. 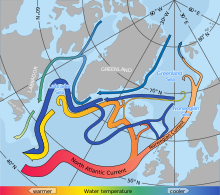 Driven by the global thermohaline circulation, the North Atlantic Current is part of the wind-driven Gulf Stream, which goes further east and north from the North American coast across the Atlantic and into the Arctic Ocean. The North Atlantic Current, together with the Gulf Stream, have a long-lived reputation for having a considerable warming influence on European climate. However, the principal cause for differences in winter climate between North America and Europe seems to be winds rather than ocean currents (although the currents do exert influence at very high latitudes by preventing the formation of sea ice). Lozier, M. S.; Owens, W. B.; Curry, R. G. (1995). "The climatology of the North Atlantic" (PDF). Progress in Oceanography. 36 (1): 1–44. Bibcode:1995PrOce..36....1L. doi:10.1016/0079-6611(95)00013-5. Retrieved 19 November 2016. Rossby, T. (1996). "The North Atlantic Current and surrounding waters: At the crossroads" (PDF). Reviews of Geophysics. 34 (4): 463–481. Bibcode:1996RvGeo..34..463R. doi:10.1029/96RG02214. Retrieved 19 November 2016. Seager, R.; Battisti, D. S.; Yin, J.; Gordon, N.; Naik, N.; Clement, A. C.; Cane, M. A. (2002). "Is the Gulf Stream responsible for Europe's mild winters?" (PDF). Quarterly Journal of the Royal Meteorological Society. 128 (586): 2563–2586. Bibcode:2002QJRMS.128.2563S. doi:10.1256/qj.01.128. Retrieved 25 October 2010. This article about a specific ocean current is a stub. You can help Wikipedia by expanding it.